Posted by OeWF in OeWF News, Press Releases. Today the Austrian Space Forum (OeWF) in cooperation with the Oman National Steering Committee started AMADEE-18, OeWF’s 12. Mars simulation to take place in the Dhofar desert in Oman. Under Austrian leadership, the AMADEE-18 field-crew will conduct experiments in the fields of engineering, planetary surface operations, astrobiology, geophysics/geology and life sciences to pave the way for future human Mars missions. During today‘s press conference at the AMADEE-18 Mission Support Center in Innsbruck, Austria the Austrian Space Forum offered media representatives an insight into the Mars simulation and its objectives. During the next three weeks the mission-crew will conduct 16 experiments as well as test equipment and materials. 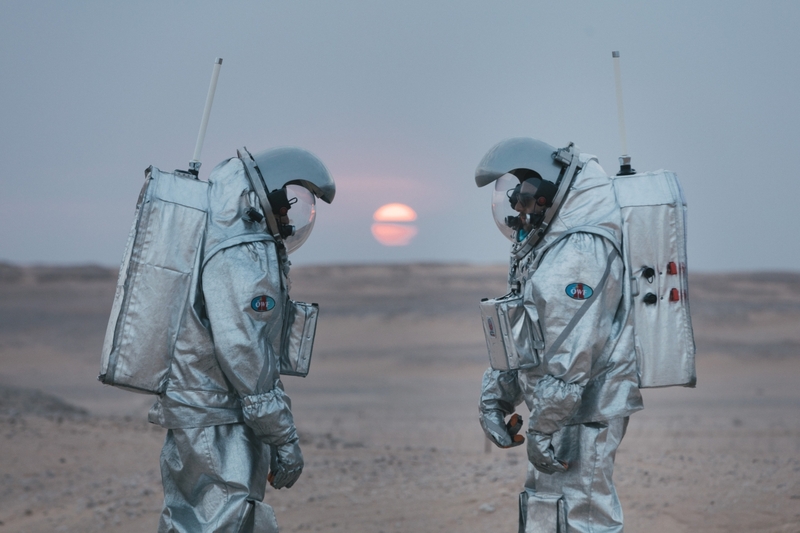 Communication between the field crew in Oman, simulating Mars, and the Mission Support Center in Innsbruck, Austria, simulating Earth, will be delayed by 10 minutes, mimicking the time lag between the two planets. For the duration of AMADEE-18 expedition outlets at the Ars Electronica Center in Linz and the Vienna Planetarium will offer more insight into this Mars simulation as it evolves. Following the simulation the Austrian Space Forum will conduct a conference in Mai 2018 to present preliminary results of the mission. Details about AMADEE-18 industrial and science-partners can be found below. PDO is playing a key role in supporting an international Mars field simulation which will take place in the Company’s concession area. The Company is offering logistical, health, safety and environment (HSE) and other support to the Amadee-18 project team. Site services including provision of skips and waste removal, collection of sewage and emergency maintenance response. T-Mobile Austria is the second largest mobile telecommunications provider in Austria with 4.6 million customers and approx. 1,300 employees. The brands T-Mobile and tele.ring address various target groups – starting from smartphone consumers to sole proprietorships and even large enterprises. As a part of the Deutsche Telekom group T-Mobile benefits from the innovative capacity and the financial stability of the group, one of the biggest global player in the telecommunications market. In the fiscal year 2016 the group reported a turnover of 73.1 billion Euros. T-Mobile Austria serves amongst other functions as machine to machine communication (M2M) expert for the Deutsche Telekom group. For its business customers T-Mobile offers a wide range of cloud based solutions. Whether in ice caves, on the summit of a glacier or on the sand dunes of a desert, LANCOM Systems has been supporting the Austrian Space Forum (OeWF) in its field research for years. Professional network components (such as WLAN access points and routers) enable smooth communication and stable data transmission. In order to master the extreme climatic conditions on its twelfth Mars simulation in the desert of Oman, the OeWF has yet again decided to use professional, reliable network infrastructure from Germany. MATTRO from Austria stands for social, ecological and economic sustainability. We have been enthusiastically developing battery-electric vehicles in our engineering office since 2006. This includes our own vehicle- and battery-production as well as the development of new solutions for and with customers. We are not orientated towards existing concepts as can be seenregarding the Ziesel, which is a single-tracked vehicle that overcomes particularly rough terrain. MATTRO is very happy to provide a Ziesel for the Mars simulation in Oman. After passing endurance tests at a physical limit and in open space, the Russian Federal Space Agency ROSCOSMOS decided to name FORTIS as the official timekeeper for its missions. Since their orbital baptism of fire aboard the space station MIR in 1994 FORTIS watches belong to the strictly defined equipment of cosmonauts. Putting forward over 100.000 earth orbits no other watches have spent more time in space. In honor to the pioneering cooperation with the space authorities their emblem is engraved in the case back of all FORTIS Cosmonautics Collection models like the legendary FORTIS Official Cosmonauts, the first automatic watch in open space. For having such a rich & proven history in manufacturing space watches the AMADEE-18 team decided to choose FORTIS as official timekeeper for all relevant tests during the mars mission in the desert of Oman. 360fly, Inc., maker of the category-leading, single-lens cameras that captures stitchless 360-degree video, is the live streaming partner on this mission. Viewers will be able to get a unique perspective on the mission live and in 360 degrees. The camera used to live stream the crew is the 360fly® 4K PRO. This camera changes the landscape of professional live streaming with its continued power source and immersive 360-degree viewing experience. Founded in 1996, ic! berlin is a leading, award-winning eyewear label in Berlin whose goal is to discover, develop and market new ideas in eyewear. ic! berlin’s screwless glasses embody the spirit and philosophy of the company: they are naked and pure. They are both wearable and extreme, built to last a lifetime, unbelievably flexible and feather light. Every single ic! berlin frame is handmade with love in Berlin. What started in a small two-room apartment now takes up a space roughly the size of the field inside Berlin’s Olympic Stadium; design, production, sales, distribution & marketing all happen under the ic! berlin roof. Today, ic! berlin glasses are sold in over 60 countries. In the Dhofar desert these high end glasses will protect the eyes of the field crew from sun and sand. Manas.Tech designs and develops unconventional software, partnering with innovative organizations to help them push the limits of the status-quo with technology. They developed the mapping and navigation interface for the Head Up Display in the OeWF-spacesuit simulator’s helmet making use of their design experience around resource constrained scenarios, combined with GIS, performant graphic rendering techniques, and software design for embedded platforms. Skriware delivers 3D printers and an educational ecosystem based on 3D printing technology. The company helps users to develop the 21st century STEM skill set through the process of designing, building, and programming 3D printed robots. The core part of Skriware EdTech solution is an intuitive, Plug’n’Play 3D printing device integrated with an online platform with a dedicated educational content – 3D models and e-learning courses. While the product requires no prior experience in 3D printing or robotics, it is still designed to fully meet the expectations of advanced users. During AMADEE-18 a 3D printer will be used that is also in operation on the international space station ISS. By using a 3D printer to produce tools on demand, repairs to broken tools and production of new parts for unplanned needs, the experiment will measure how the use of this technology benefits Martian operations. Tespack is the first company specialized in providing a complete mobile energy experience by creating commercially ready Smart Wear and Energy solutions for the consumer sector. They combine latest technology and connectivity with premium design. Their technology solves SmartWear devices’ biggest problems: battery life, energy generation and soon connectivity. During AMADEE-18 the first smart solar helmet will be tested. It can power action cameras on the go and increases the battery life of an action camera from 1 hour to 11 hours. Furthermore it can also power smartphones and can be recharged in 3 ways: Solar, USB and Ultra-fast charging 12 mns. It provides an App that can give its user an accurate battery lifetime of all his mobile devices and charging point locations. In December 2017 the OeWF (Austrian Space Forum) contacted the University of Applied Sciences for Health Professions Upper Austria, Study Program Dietetics for support in menu planning for mission AMADEE-18 in Oman. The mission is planed from 31st of January to 3rd of March 2018. Participating will be 19 field crew members (FC) from the scientific part of the mission and 26 members of the bridge crew (BC). Some members do have restrictions in their diet or strong dislikes. The University of Applied Sciences for Health Professions Upper Austria drafted weekly menu plans including recipes and a corresponding food lists. Within the menus recommendations related to energy requirements of the scientific members of the mission as well as special diet, restrictions and strong dislikes have been considered. Furthermore menus and recipes have been created to be prepared in a field kitchen with limited facilities. Moreover recipes planned should not be to challenging because FC members will prepare food themselves, 2 FC members per day will be responsible for catering management within the field. The technology and capital goods group voestalpine, with its comprehensive knowledge in manufacturing metal powder and the production of ready-to-install components, is a global pioneer in Metal Additive Manufacturing. A special tool manufactured using the voestalpine 3D metal printer is on board at the AMADEE-18 mission: the highly sophisticated scoop for taking samples was developed and produced by the voestalpine Additive Manufacturing Center GmbH in Düsseldorf. “We have been dealing with mobile fastening technology for 30 years. The main product is an elastic, easily detachable cable tie (MICRO-FIX). With the development of our infinitely adjustable clamping rubbers, we have pushed the limits of what is possible in the field of – binding – bundling – fastening – securing small goods to be transported. Now it is an honor and a pleasure for us, to facilitate the work of other teams like the OeWF by shifting their borders with “BIND-FIX”. Fair Rescue International has been a complete outfitter of rescue and emergency medical equipment for 20 years. Thousands of rescue- and emergency medical missions form the basis of this competence. One of the strength is the in-house development and production of Emergency Backpacks and Rescue bags. Fair Rescue International has been a partner of OeWF for many years when it comes to supplying and equipping rescue and medical equipment. Astrobiology HortExtreme Italian Space Agency Mobile and inflatable green house with hydroponics, to be used for the cultivation of microgreens. Human Factors MIMIC TU Graz, Austria, Signal Processing and Speech Communication Laboratory A computerized analysis of verbal communication to study the mechanisms of psychological and physiological adaptation or maladaptation in extreme or stressful environments. Virtual Reality V(R)ITAGO Mars Planet, Italy Virtual Reality tool for astronaut training and to aid the RSS (Remote Science Support) team in analyzing geological features.